Journalist and co author of the best seller “Pesticides”, Fabrice Nicolino is concerned by the consumption of meat in the world nowadays. In his book, he talks in a very straightforward way about the frightening issue of industrial meat (“bidoche”, in French). He says it’s of very poor quality, because of the way the animals are fed (with GMOs) and because of the drugs they are given. In Europe, 70% of the total cultivated area is used the feed the cattle because it takes 7 to 9 vegetal proteins to make only one animal protein. Industrial breeding doesn’t only consume lots of energy, it’s also a threat to climate balance and most of all destroys the relationship between men and animals, pushing men to be very cruel. Living beings with sensitivity are reduced to the level of a merchandise. In the book the author describes very clearly the tragic cycle of meat consumption, which is increasing with countries like China and India, to the detriment of the environment, of health (swine flu is one very good example of that), of hungry men and of animals themselves. 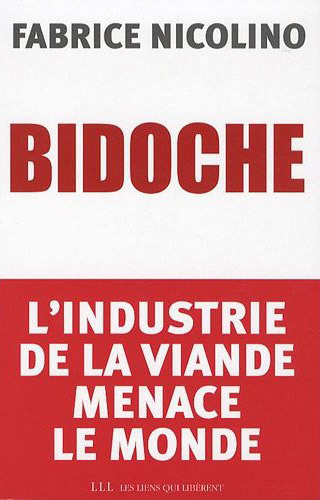 « Bidoche », by Fabrice Nicolino, Ed. Les Liens qui Libèrent. 19,95€.